Recognised by the Zero Project as an ‘Innovative Policy on Accessibility‘ in 2014, Uganda’s Accessibility Standards are an important start in advocating and enforcing an accessible environment for all persons, including persons with disabilities. In 2007, a Ugandan ministerial report found that 95% of the buildings in Kampala were not accessible, despite the fact that several laws emphasised the need to have an accessible physical environment, such as the Persons with Disabilities Act and National Policy on Disability, both of 2006. In many countries in the Global South, accessibility standards do not exist. In the few countries where they exist, they are often not legally binding, not enforced and not monitored.Uganda is among the first sub-Saharan countries to have developed their own accessibility standards, with the objective of them acting as a blueprint and be a tool for measurement, assessment and advising. After an in-depth review, in 2010, the Uganda National Action on Physical Disability and the Ministry of Gender, Labour and Social Development developed Uganda’s first Accessibility Standards. Uganda is among the first sub-Saharan countries to have developed their own ‘Accessibility Standards’. Uganda’s Accessibility Standards are an important start to advocating and enforcing an accessible environment for all persons, including those with disabilities. By providing a series of practical and detailed maps for construction planners, the Accessibility Standards are a blueprint and tool for measurement, assessment and advice. In addition to a National Accessibility Audit Committee, committees in several districts were set up to enforce compliance. Uganda is among the first of the sub-Saharan countries to have developed such standards, with few countries in the Global South having enacted legally-binding, enforced and monitored accessibility standards. They constitute an important start to advocating and enforcing an accessible environment. Their objective is to draw up a blueprint and be a tool for measurement, assessment and advising. The Ministry of Education and Sports initially adopted them for all school construction projects and then later, in 2013, the Standards became a requirement for the approval of all construction projects under the national Building Control Act. By promoting accessible planning and construction, the Standards help all actors to work more efficiently. The Standards promote the inclusion of persons with various types of disabilities, a generally a marginalised and vulnerable group. From the implementation of the Standards, other vulnerable groups will benefit, such as the elderly, women, children, and people with temporary impairments, etc. By promoting an accessible environment, the Standards raise awareness, promote attitudinal shifts, challenge stereotypes, and contribute positively to human health, from the avoidance of accidents to easier access to water, sanitation and education. The development of the Standards was led by the Uganda National Action of Physical Disability (UNAPD), a disabled people’s organisation (DPO), which worked together with other DPOs and Ministry stakeholders. As part of the Standards’ implementation, the access audit team involves DPOs for their monitoring. UNAPD promotes awareness of the Standards at all levels and engages stakeholders to ensure that other laws integrate them. The Standards are a guidance tool to accessible environments for planners. The Government Line Ministries for Disability Issues (Transport, Social Development, Education, Health) oversee the implementation of the Standards. A National Accessibility Auditing Committee, plus some District Auditing Committees, were established to work efficiently and transparently for compliance. Under the Building Control Act of 2013, the Standards became mandatory for the approval of all construction projects. In particular, the Ministry of Education mandated the use of the Standards for all schools funded at the national level and Education Departments have started to inspect their accessibility. The Standards promote the inclusion of a very vulnerable group of people and this is a key to social justice. An accessible environment is also important for economic development and the reduction of poverty. The Standards can serve as a good tool for developing guidance on accessibility in low resource contexts. In 2007, the Building and Construction Inspection Report of the Ugandan Ministry of Works, Transport and Communication found that 95% of the buildings in Kampala, Mpigi and Wakiso were not accessible. This is in spite of the fact that several laws emphasised the need to have an accessible physical environment, such as the Persons with Disabilities Act and National Policy on Disability (both of 2006). One of the reasons given for the limited implementation of these laws was the absence of standards. For this reason, after an in-depth review of literature, the Uganda National Action on Physical Disability (UNAPD) and the Ministry of Gender, Labour and Social Development developed the Accessibility Standards, with the support of Dansk Handicap Forbund and in consultation with other stakeholders, including disabled people’s organisations, architects, physical planners, building engineers and community development workers, different government ministries and departments. 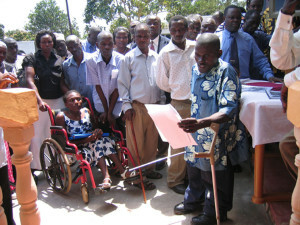 On 27th May 2010, Uganda launched its first Accessibility Standards. In order to secure effective implementation, the Building Control Law of 2013 refers to the Accessibility Standards which have become a requirement for the approval of all construction projects. The Accessibility Standards aim to improve equal access for all people and to enable those with disabilities to “live independently and participate fully in all aspects of life”. The objective is to draw up a blueprint and a tool for measurement and auditing, in order to promote and enforce an accessible environment. In order to ensure comprehensive implementation, the Standards contain the guiding principle of a fully accessible trip chain: persons with disabilities must be able to exit the home, access a sidewalk, enter a vehicle, alight from the vehicle onto a sidewalk near the workplace, reach the entrance of the building, manoeuvre within the building and reach their workstation. In addition, the Standards require implementation that takes the different access barriers into account that wheelchair users, persons with visual and hearing impairments, with intellectual disabilities, and other groups (elderly etc.) encounter. The Ministry of Construction, along with the Ministry of Gender and Social Development (line ministry for disability issues), the Ministry of Education and the Ministry of Health, are the main ministries that oversee the implementation of the Standards. Doors, including fire exit doors. Accessible water and sanitation facilities, including toilets, toilets with showers and pit latrines. Pathways and corridors inside buildings. The Accessibility Standards are included in the Building Control Law as Schedule Four (passed in May 2013 by the Parliament of Uganda) and the Accessibility Standards became a requirement for the approval of all construction projects. To promote and enforce compliance, a National Accessibility Audit Committee was set up, composed of professionals of the built environment, ministerial staff, and disability experts from different organisations (in total 8 members). In addition, District Auditing Committees have been set up. Teams of at least two professionals in disability and accessibility carry out audits, with the help of checklists, to review the compliance of the built environment with the help of its guidelines. Such teams write a report containing an analysis of the state of accessibility, and carry out periodic monitoring. Persons with disabilities in Uganda are well-organised and have their own representatives at every level of government. With the Standards they can raise awareness, familiarise key stakeholders such as ministry representatives and policy-makers with the concept of accessibility, instruct architects, engineers and contractors about accessible construction, and undertake the necessary audits and advocacy campaigns. Within a short time of their launch, the Ministry of Education mandated the use of the Standards for all school construction projects funded at the national level and Education Departments at district level started to inspect schools on their accessibility. In what can be deemed a considerable success, the inclusion of the Accessibility Standards in the Building Control Act of 2013, makes them compulsory for all construction projects. The Accessibility Standards are increasingly being used by contractors, builders, engineers, architects during the planning and construction of facilities, and by government line ministries and departments, DPOs and CSOs in the creation of accessible environments. Various stakeholders have been trained on accessibility as well as accessibility auditing which is conducted to assess whether a facility conforms to the Standards. Development and implementation of accessibility standards are highly replicable. This has been clearly demonstrated by Uganda, as Denmark’s already binding accessibility standards were used as the basis for the formulation of Uganda’s policy. In Denmark, accessibility standards to buildings are regulated through ‘The Building Act and Danish Building Regulations (2008)’, which covers accessibility to new buildings, refurbishment and renovation of existing buildings. Denmark has continued to be at the forefront of this progressive legislation, where the Buildings Regulations introduced a host of new requirements for accessibility for persons with disabilities, and existing accessibility requirements have been significantly tightened. With Uganda setting a precedent in the Global South, other countries have taken note and there has been declared interest in replicating Uganda’s experience from Ghana. Currently, the Ghana Standards Authority (GSA) is in the process of defining accessibility standards of public buildings and walkways. If implemented, Ghana will follow Uganda’s lead in taking affirmative action and this legislation can serve as a clear, viable and workable model for wider implementation by states, both in the region and across the world. Zero Project Website: Uganda: Mandatory Accessibility Standards. WHO/WB, World Report on Disability, 2011, p. 176.
International Campaign to Ban Landmines (ICBL), Physical Accessibility for Landmine Survivors Briefing Paper, May 2013. Apollo Mukasa, Uganda National Action on Physical Disability, Uganda.